Pneumatic Die Extractor, Ball Top Table. 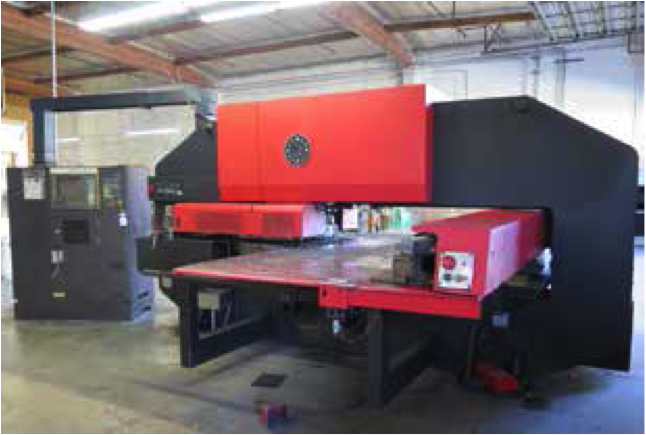 1984 Amada RG-80 80 Ton x 8’ CNC Press Brake s/n 806076 w/ Amada CNC Controls, 94.6” Bed Length, 98.7” Max Bend Length, 80.8” Between Uprights, 15.76” Throat, 3.94” Stroke, 14.58” Open Height. Amada M-2045 3/16” Cap x 78” Hydraulic Shear s/n 2401925 w/ Amada Controls, 78.74” Max Cut Length, 84” Squaring Arm, Front Supports, 60 Strokes/Min. Pem-Serter Series 4 6 Ton x 18” Hardware Insertion Press s/n C4384. Perkins mdl. 400B OBI Stamping Press. Index Vertical Mill s/n 55-5401 w/ 6-Speeds, 1 Hp Motor, Power Feeds, 9” x 35 ½” Table. Doringer mdl. D350 12” Miter Cold Saw s/n 21674 w/ 2-Speeds, Speed Clamping. Abasive Finishing “Super Quiet Burr Bench” Media Tumbler. Hitachi mdl. HU-14 14” Abrasive Cut Off Saw. Craftsman 20” Pedestal Drill Press w/12-Speeds, 2Hp Motor. (2)Delta mdl. 17-900 Pedestal Drill Presses. Ryobi 4” Belt / 6” Disc Sander w/ Stand. Hubbleston mdl. 880A 25Hp Horizontal Air Compressor w/ 3-Stage Pump, 240 Gallon Tank. Ingersoll Rand SSR Rotary Air Compressor w/ Intellisys Controls. Pneumatic Disc Grinders, Pad Sander and Drill. 48” x 72” x 6” Granite Surface Plate w/ Stand. Amada Sabcon-9 II (EXP) Digital Shearing Backgauge System Upgrade Package. Clark 6000 Lb Cap LPG Forklift w/ 2-Stage Mast, Cushion Tires. Cantilever Sheet Stock Material Rack.